I’m now up to, and have complete, day 30 of the Insanity workout. Day 30 is the 2nd day of ‘recovery week. Shown below is my latest progress pic, taken on day 28. Very happy with the progress especially considering my recent diet – lots of barbecues and beers! This entry was posted in Exercise, Fitness, Insanity Workout and tagged exercise, fitness, Insanity, Insanity Workout, Workout on July 30, 2013 by Stephen Hoult. I’ve completed Day 18 of the Insanity Workout. (Just!) The hangover from last night’s barbecue didn’t help, neither did the pain in my shoulder / neck. Don’t know where that came from but it made things a little difficult – at least it was Cardio Recovery day. Football tonight and then tomorrow’s workout will be Cardio Power & Resistance. This entry was posted in Exercise, Fitness, Insanity Workout and tagged exercise, fitness, Insanity, Insanity Workout, Workout on July 18, 2013 by Stephen Hoult. Insanity Workout – Day 16 is now over with. Today was the ‘Plyometric Cardio Circuit’ routine. I struggled today (do I say that every day?) – didn’t feel like I had any energy. I can’t say I’d noticed a difference in my body but I’ve just put yesterdays progress pic up against the pic from day 1 and you can see a big difference. It’s nice to know the hard work is paying off both via visuals and by test results and just generally feeling fitter. If you’re yet to see the progress pic and read about my latest fit test results then see day 15, otherwise the latest progress pic can be seen below. Tomorrow is ‘Pure Cardio’ followed by ‘Cardio Abs’… Bring it on! This entry was posted in Exercise, Fitness, Insanity Workout and tagged exercise, fitness, Insanity, Insanity Workout, progress, Workout on July 16, 2013 by Stephen Hoult. Insanity Workout day 15 is now complete. The routine for today was the fit test. This is the second time (third actually as I did the fit test on day 0 to see if I liked the Insanity Workout). Read about Day 1 and the first fit test. The fit test is performed every 2 weeks to measure improvement and consists of doing 8 exercises for 1 minute each, performing as many reps as possible in that time with a minute to minute and a half break in between exercises. Well, it’s working, my score for each of the 8 exercises was improved after only 14 days of Insanity. Some scores improved by 25%, and the overall number of reps rose by 100. Globe jumps are my nemesis, although the 2 extra globe jumps may not look like much improvement, 1 rep = 4 jumps, so to do 8 more jumps is a fairly decent improvement. Overall, a great improvement, let’s hope that in a fortnight the results have improved once more! I’ll hopefully get a day 15 progress pic to post tonight so we can see how I compare to my starting point. And here is the progress pic. And compared to day 1 – there is a definite improvement. This entry was posted in Exercise, Fitness, Insanity Workout and tagged exercise, fit test, Insanity, Insanity Workout, Workout on July 15, 2013 by Stephen Hoult. Day 14 of the Insanity Workout was a rest day! Though a 3 and a bit mile walk was done while playing a (poor) round of golf. See how day 15, fit test 2, went. This entry was posted in Exercise, Fitness, Insanity Workout and tagged exercise, fitness, Insanity, Insanity Workout, Workout on July 14, 2013 by Stephen Hoult. I’ve now completed day 13 of the Insanity Workout. This was the first dual routine – two workouts were scheduled for today, ‘Pure Cardio’ and ‘Cardio Abs’. I decided I’d do them both in one go, rather than spreading them out over the day. I have to say, it’s not the right weather for doing these workouts – it’s far too hot! I was absolutely dripping with sweat by the end of ‘Pure Cardio’, nevermind after ‘Cardio Abs’. Today was the first time the ‘Cardio Abs’ routine has been scheduled – it’s only 20 minutes (ish) long, but it’s very hard work – my abs (and lower back) we’re burning! Looking forward to a rest day, and round of golf tomorrow, and getting straight back into the insanity on Monday with the fit test! We’ll see how much my fitness has improved – as I sure feel like I have gotten fitter and stronger. This entry was posted in Exercise, Fitness, Insanity Workout and tagged exercise, fitness, Insanity, Insanity Workout, Workout on July 13, 2013 by Stephen Hoult. Day 11 of the Insanity Workout is now done. Today’s routine was ‘Cardio Recovery’. We did this back on day 5, and it is scheduled once a week for the first 4 weeks. Cardio recovery involves absolutely no cardio, lots of stretching, balance and slow muscle work. Slow squats, pulses and planks. I’m not keen on this routine, purely because I’m not flexible and don’t really like stretching, so I struggle with it. Though of course, sticking with it, will improve my flexibility. Bring on Day 12 – ‘Cardio Power & Resistance’ tomorrow and football tonight! See how day 12 went. This entry was posted in Exercise, Fitness, Insanity Workout and tagged exercise, fitness, Insanity, Insanity Workout, Workout on July 11, 2013 by Stephen Hoult. A quick post which will hopefully help anyone who had the same problem finding the ‘Cardio Circuit’ routine for Day 10 of the Insanity Workout. The bundled schedule / calendar actually has a typo, the routine for day 10 should read ‘Plyometric Cardio Circuit’. 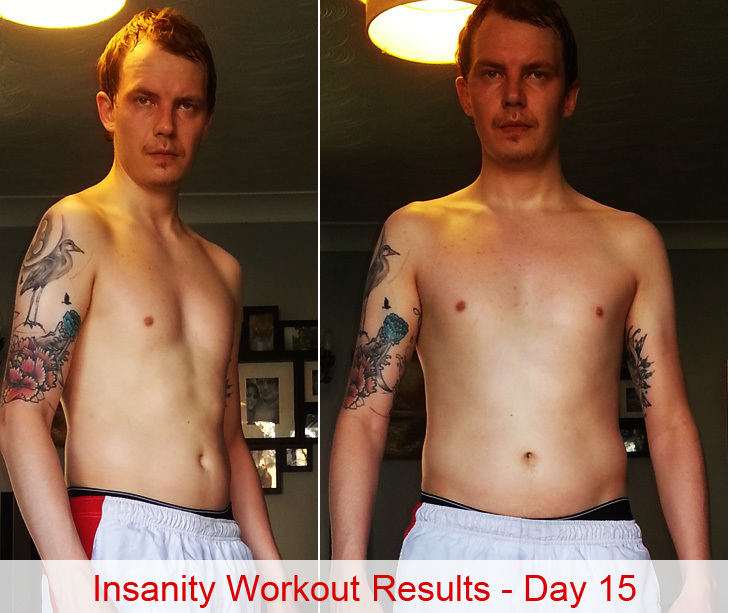 See how I got on with Day 10 of the Insanity Workout, doing the ‘Plyometric Cardio Circuit’ for the third time. This entry was posted in Exercise, Fitness, Insanity Workout and tagged Cardio Circuit, exercise, fitness, Insanity, Insanity Workout, Workout on July 10, 2013 by Stephen Hoult. 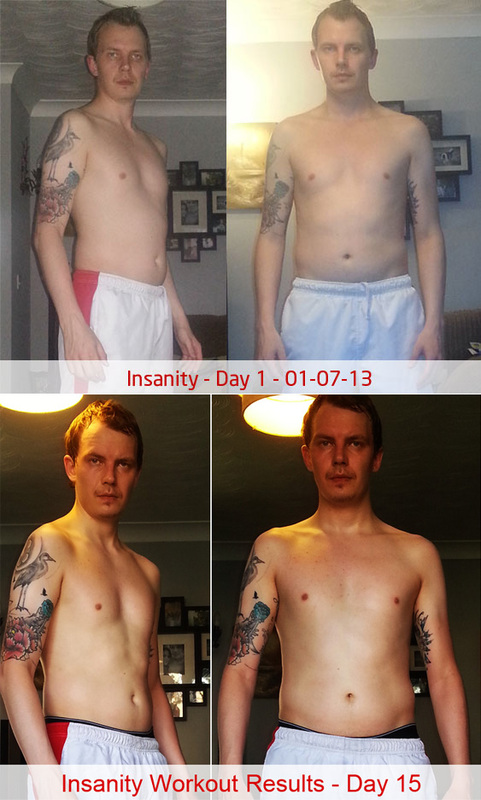 Day 10 of the Insanity Workout is now complete – after a little confusion at the start. As I said in yesterday’s post I was looking forward to a new routine called ‘Cardio Circuit’… well there is no ‘Cardio Circuit’ disc. It turns out that the schedule is labelled wrong and a quick google search told me that it should read ‘Plyometric Cardio Circuit’. The ‘Plyometric Cardio Circuit’ was the routine on day 2 and day 6. My favourite part of this workout is the ‘Level 1 Drills’, especially the last part of the drills which is in and out abs and how Shaun T builds up into a crescendo along with the others on the dvd shouting to get through it. I enjoyed today’s routine – it helped rid the slight hangover from last night’s barbecue. Looking forward to tomorrow and ‘Cardio Recovery’ followed by 6-a-side football on the evening. See how day 11 went. This entry was posted in Exercise, Fitness, Insanity Workout and tagged exercise, fitness, Insanity, Insanity Workout, Workout on July 10, 2013 by Stephen Hoult.